The Leafcocoon – a complete wool felt eco coffin with an optional cover. The Leafcocoon is a complete coffin – nothing else is needed. It’s completely ready to receive the body for burial. There are no hidden extras. We aim to make all the sizes to keep in stock, ready for finishing to your requirements. 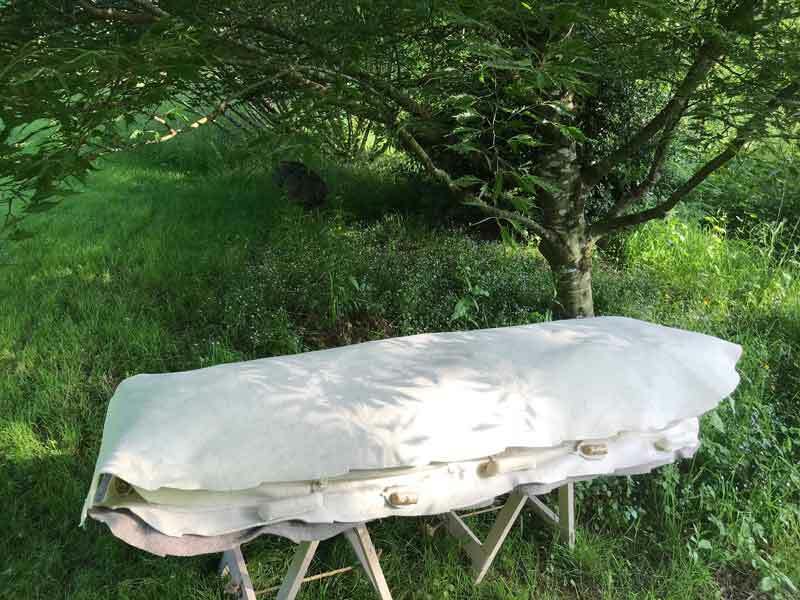 The completed Leafcocoon soft coffin can be delivered very quickly. Should you require a decorated cover, an extra 1 to 2 days should be allowed. 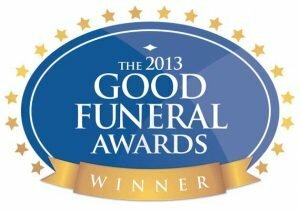 Suitable for burial in any graveyard, cemetery or burial site. 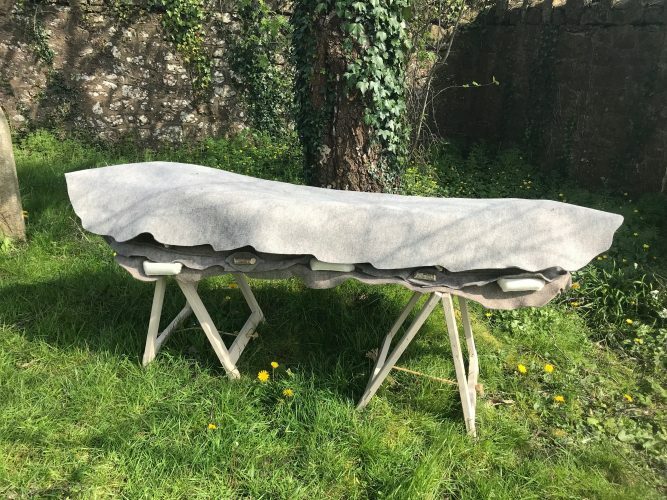 Fully biodegradable and environmentally friendly, it’s hand-made in Devon, England. 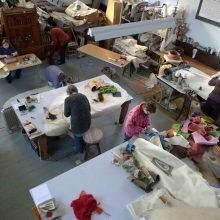 Every coffin cover is individually hand made, so there are no two alike. 3 leaf sprigs included – see photos for examples. 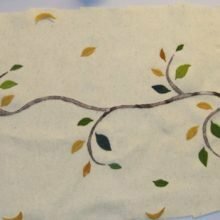 Please state your preference for type of native leaf in the order notes at Checkout – or Contact me to discuss more detailed designs than those shown. Extra detail may incur an hourly charge. Order on-line or please Contact Yuli for personal help and advice. 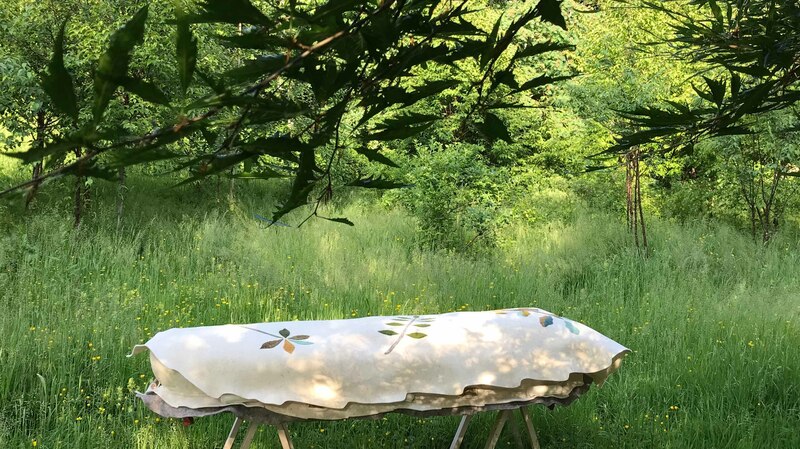 “It was the most beautiful funeral I’ve ever been to – yet probably the least expensive. When my friend’s mother died aged 96 her family dispensed with all modern death practices… no embalming, no crematorium and no coffin…. [they] put her into a cocoon embroidered [needlefelted] with leaves made from woollen felt by the artist Yuli Sømme…” – Janice Turner, The Times. 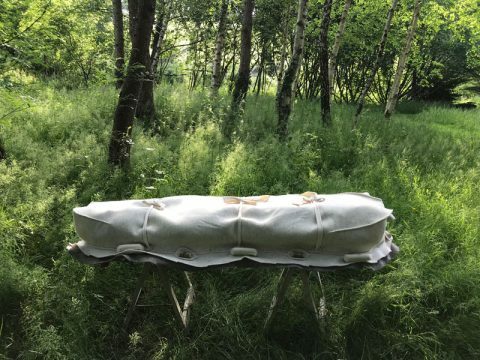 The Leafcocoon is fully biodegradable and a complete alternative to conventional coffins, designed for an environmentally friendly traditional, meadow or woodland burial. It is leaf-shaped, reflecting our connection with nature, with a smooth outline because of the many layers of thick felt. 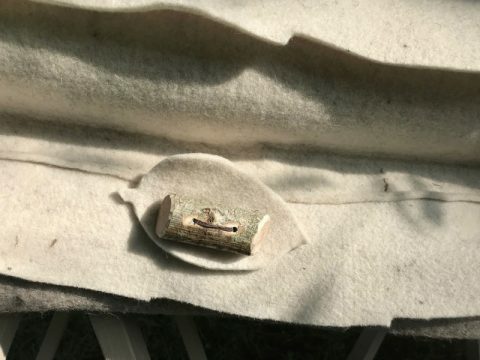 Leafcocoon base – Made of a strong wooden frame, encased in felt, lined to prevent leakage. Six strong handles take the weight. Bespoke versions can be made to order if a specific size/weight bearing is required. Leafcocoon without cover – £675 The shroud is strapped to the base, has enclosures for head and feet and is double wrapped from the sides. 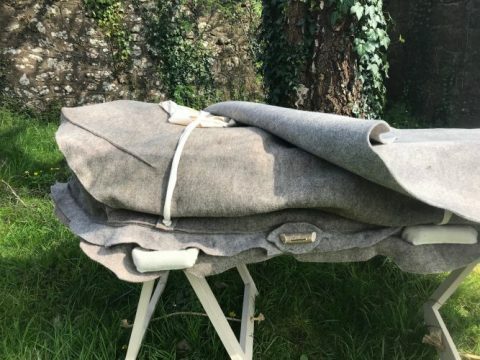 The woollen shroud can also be ordered separately without the base and for use in other coffins. 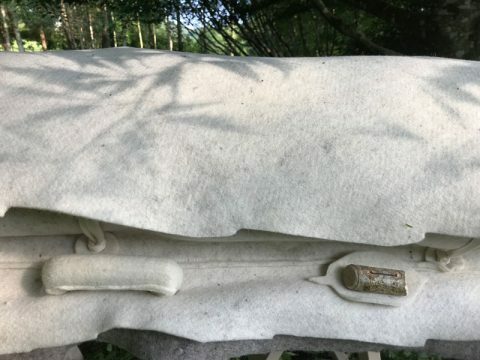 Leafcocoon with plain cover – £725. Add a plain leaf-shaped cover that shelters the shroud and gives an even smoother outline. Leafcocoon with decorated cover – £885. A simple, needle-felted design adds a touch of colour – natural dyes used, of course – and based on native leaf themes. Please email or ring me if you would like to discuss a bespoke design. Extra decoration is charged at £45 per hour. I make the bases in different sizes and keep a ready-made stock which can be prepared, finished and delivered between 2 to 5 working days. 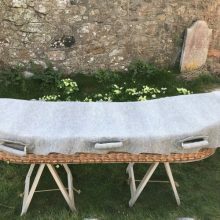 Individually hand-made on Dartmoor from entirely natural materials, using wood and 100% pure organic wool felt from local sources. Extra Large for heavier weight bearing OR sizes under 5′ – made to order, please contact Yuli.